* Pour Monsieur starts off as a classic men’s cologne – a mix of citrus and lavender. It’s fresh, but has depth with some green woodsy notes filling it out. * The Concentree version that I am reviewing is available in the U.S. and is a tan-colored liquid. The non-concentree version is only available in Europe and is a completely different scent. * The top gradually fades away as a potent mix of spices comes up. Cardamom is the leader, with nutmeg and allspice in the mix as well. It is slightly animalic, yet I swear there is a subtle vetiver in there as well. * After the spices being to take control, the scent comes closer to the skin. It’s still present but doesn’t project as loudly. * The base is a refined yet rugged oriental with vanilla and amber, supported by an earthy, foresty resin and a gentlemanly musk. Summary: To use fragrance terms, the concentree version is a citrusy cologne that transforms into an oriental, which is very different than the green chypre feel of the original. The longevity is exceptional, lasting at least twelve hours (or until you shower). The base lasts a long time and is close to the skin. While the scent is classic and mature, it’s not ‘old man’ or overpowering. It would smell as good on a twentysomething as a sixtysomething. 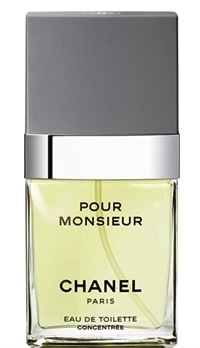 Over the years, I’ve been through at least three bottles of Pour Monsieur as it is a no-brainer, easy to wear scent that always elicits compliments from others. I’ve yet to review this scent despite loving it. And I do agree it is ageless. And I think it is unisex but it needs to be paired with a really femme personality for a contrast, ya know? And I get that vetiver too. It’s there.